Spencer Gallagher and David Gilliland set the front row. It’s a 94 lap event. Green flag, Gallagher gets the jump on the outside lane. He heads to the bottom in turn one and confirms the lead. Lap 9, Myatt Snider has a run on the outside. He pushes Crafton to the lead. Snider drops to the bottom, he moves to the lead. 8 to go in stage 1, Johnny Sauter moves to the lead. Things are dicy behind him. Freisen gets shuffled out of line, he drops through the center of the field. Enfinger to the lead. The top three run single file around the bottom. Two by two for 4th on back. John Hunter Nemechek leads the outside lane. He’s aggressively side drafting. He’s up to 3rd, now 2nd. He lifts and loses ground. Coming to two to go, two trucks head for the pit lane. Enfinger remains the leader. Nemechek is still working the outside lane, Gilliland is all over his bumper. Grant Enfinger takes the win in stage one! Austin Hill and Spencer Gallagher lead them to the restart. Green, they run side by side. The bottom lane prevails and Austin Hill takes over the lead. Lap 29, the top 15 run single file around the bottom. Lap 32, the outside line is coming in a hurry. Spencer Gallagher leads that train. He’s there, they run side by side. Depp in the pack, Myatt Snider gets completely sideways, he saves it. 6 to go in stage 2, Gallagher is finally clear on the top. He swings from the top to the bottom. Gallagher now leads on the bottom. 3 to go, Spencer Gallagher heads to the pit lane from the lead. Several truck join him. Todd Gilliland is handed the lead. Tire rub for Thorson. 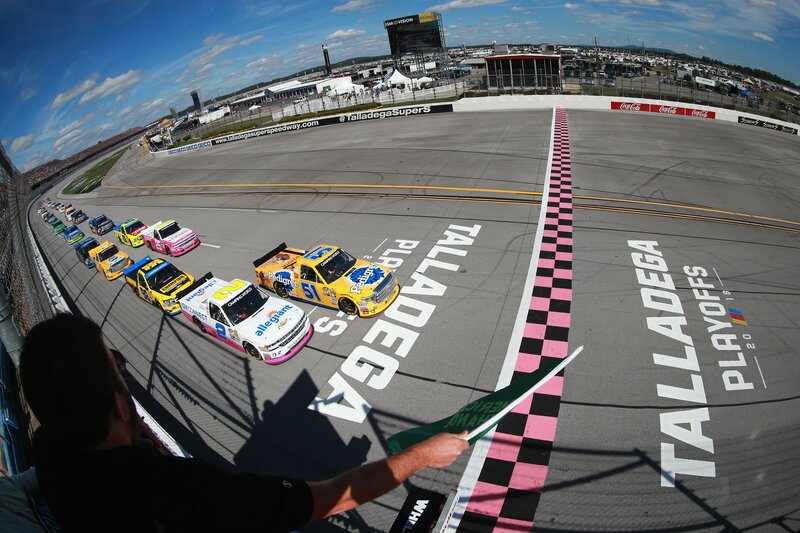 Todd Gilliland wins stage two in the NASCAR Truck Series race at Talladega Superspeedway! Lap 49, Crafton has a run on the outside lane off turn two. Spin at the back, the caution is back out. Crafton will take the lead. Green, Crafton and Enfinger run even into turn one. Lane three is coming on the outside. The top three run single file. Todd Gilliland takes the lead. He doesn’t drop to the bottom. Gilliland leads the outside lane and he’s pulling the outside train by. Gilliland drops to the bottom. Sauter takes the lead. Lap 59, Enfinger is working the outside lane. Huge crash at the front! Chris Fontaine gave a huge push to Enfinger on the top. Both of those cars opened a gap to the field. As the field began to reel them back in, Fontaine put a block on Justin Haley in an attempt to catch a bump draft. It was too late. Fontaine was turned in front of the field. Multiple cars are collected. Green, Austin Hill and John Hunter Nemechek fight for space on the bottom into turn one. 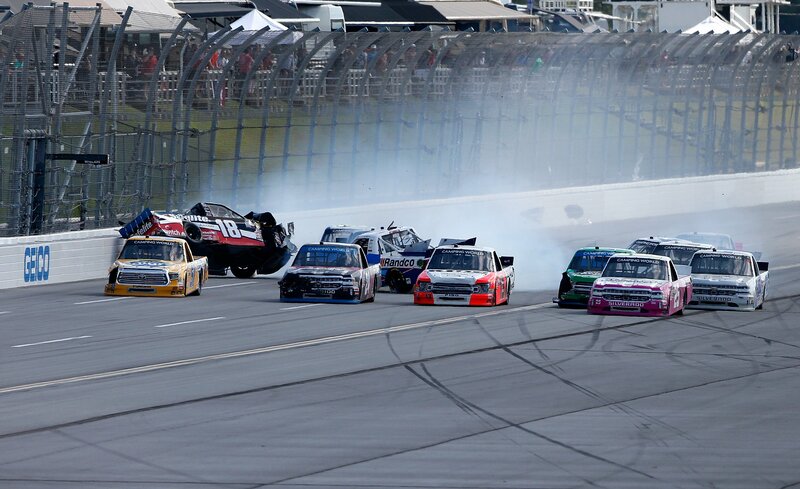 Nemechek thought he was blocking the bottom lane. He wasn’t low enough as Hill found a hole by. Nemechek tried to run him under the yellow line. Todd Gilliland continues to lead. Father, David Gilliland is on his bumper. This is their first restrictor plate race together. Under 25 to go, the Gilliland’s are shuffled out of line. Grant Enfinger takes over the lead with Justin Haley on his bumper. 12 to go, Todd Gilliland gives a push to Enfinger. The leader is pushed off the bottom. Gilliland fills the hole and is looking for the lead as they race back to the line. 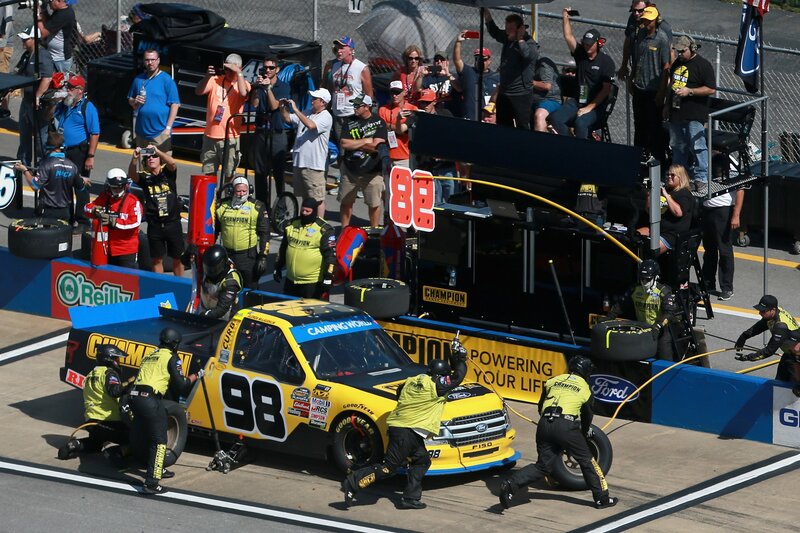 Enfinger comes back down, Gilliland was already there. Gilliland is around! He slams the inside wall. 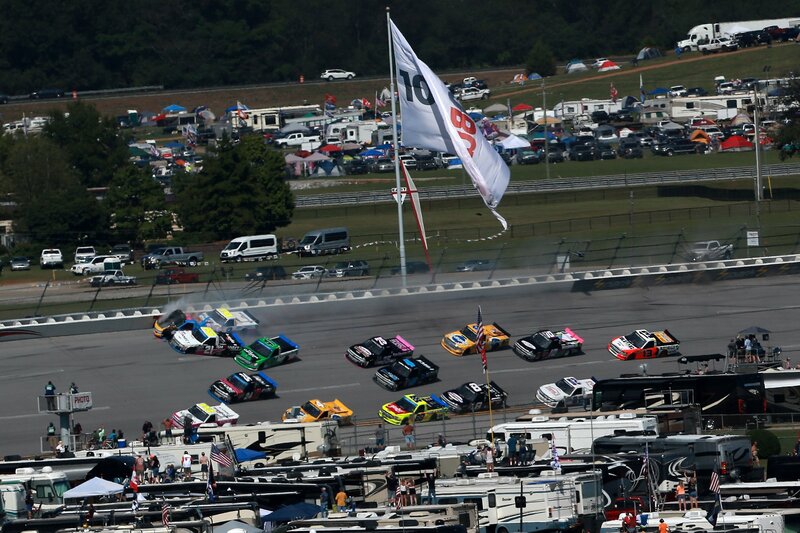 Green flag, just six lap remain in the race. Enfinger gets the jump on the outside lane. They run side by side for 2nd. David Gilliland has a huge run on the leader off turn two! He looks to the inside. Enfinger closes the door but it’s too late! Enfinger is around down the back stretch, no caution. Gilliland has damage as well. Justin Haley swings around the damaged machine to take the lead. 4 to go, Haley leads Snider, Gragson and David Gilliland. Gragson purposefully opens a gap to the cars ahead. He gets a run and swings to the top lane with help. Gragson drives by them all on the outside. He gets to the front and drops to the bottom! 2 to go, Gragson leads Peters and Haley. The top three run single file. Haley has a run on the outside lane with Gilliland on his bumper. Gragson swings to the highside off turn two to block the outside. Gragson back to the bottom. 1 to go, Haley and Gragson run even into turn one. They bang fenders off turn two. Gragson is around down the back stretch! 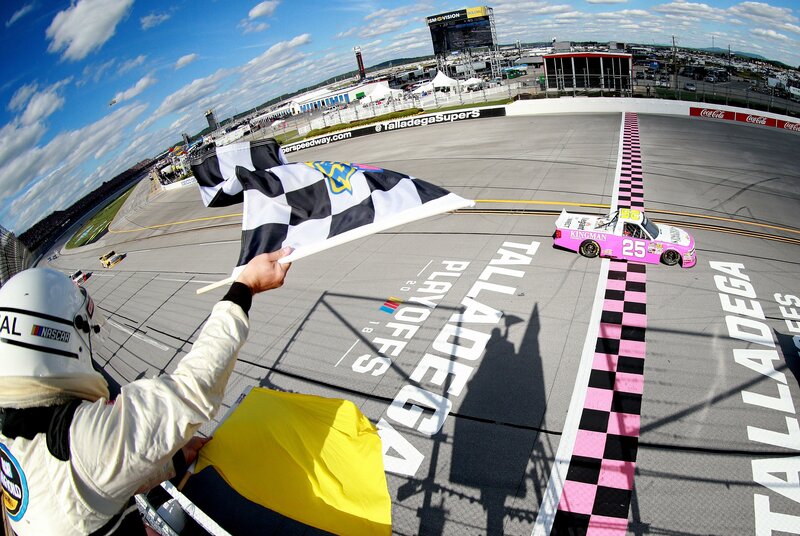 Timothy Peters takes the win at Talladega Superspeedway! 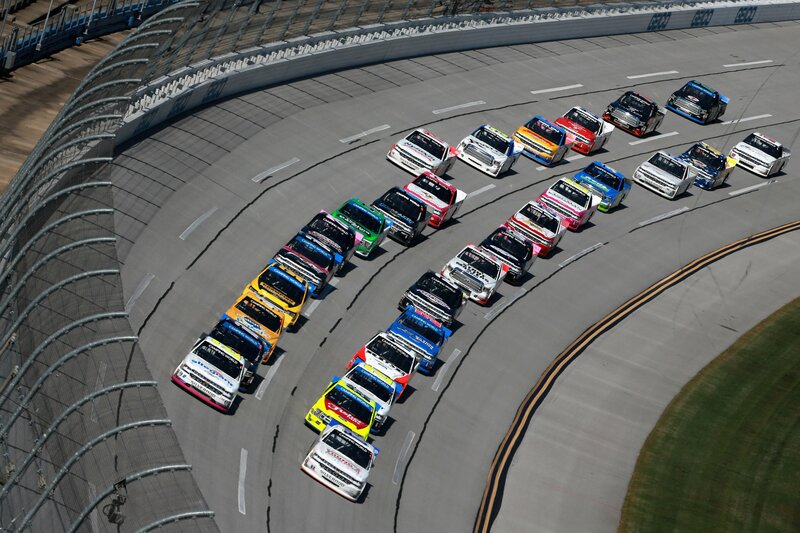 View full 2018 Talladega Truck Series results below.